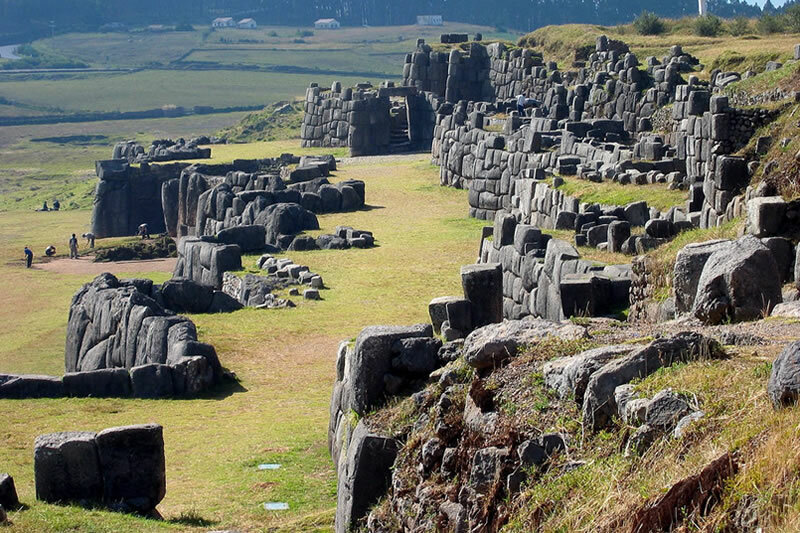 The archaeological park of Sacsayhuamán, covers approximately 3,000 hectares, and houses exuberant Andean flora and fauna, also has extraordinary Inca and pre-Inca precincts, archaeological monuments like Sacsayhuamán, Qenqo (Kencco), Puca Pucará and Tambomachay. These can be visited from Monday to Sunday and holidays in the hours of 07:00 to 18:00 hours. Keep in mind that some of these places need a payment to enter. Architectural masterpiece of the Inca Civilization, is located to the north of the city of Cusco in the top of a hill; From which you can appreciate the whole city. These are megalithic constructions to which the Spanish historians attributed at first, military ends, then religious, and finally a place of work. The walls are formed by enormous carved stones of up to 9 meters of height, 5 of width and 4 of thickness. It is estimated that the weight of the largest of these rocks is 125 tons; And doubtless wonder what every visitor to Cusco wonders how they took them there? How did they fit perfectly without the use of mortar or other glue?. The main wall consists of three successive walls, zigzagged, with platforms 360 m in length. Which are communicated by stairs and access doors. The place known as Inca throne is surrounded by rocks. Sacsayhuaman was the scene of important historical events during the conquest. At the moment it is scene of Inti Raymi, celebration in honor to the Sun (Inca deity). It is known as a sanctuary dedicated to the worship of animals, is formed by ruins formed in a rocky place with stairs arranged in zigzag, has a kind of circular amphitheater. It is known that this could be a place destined to the adoration of some animals considered sacred, since it has a block of 5.9 m. Tall with the appearance of a puma. You will find a labyrinth that leads to underground galleries, you will also find water channels, passages, and stairs; These reveal numerous engravings and drawings with figures of pumas. The site is located 4 km. Of the Main Square of the city of Cusco. Archaeological site of the Inca culture, located on top of a hill; Functioned as military point and administrative urban center. In spite of its proximity with Tambomachay, it is believed that it would have no relation with its defense. This ancient Inca fortress is formed by platforms, passages, stairs, turrets, windows and a circular wall that would have served as a defense of the whole construction. It is located 7 km from the Main Square of the Cusco. Learn more about the archaeological site of Puca Pucara. It was an Inca Sanctuary where water worship was held, was a place reserved for the Inca, and is known as the Inca Baths. It is evident the enormous knowledge of hydraulic engineering that the Incas possessed, it has constructions of fine finish. They are walls joined by stairs, with springs that run through channels. There are waterfalls that drain into a small pond. The truncated windows, holes or niches of 2 m. According to the historians, in this place the Incas and its court, worshiped the god Inti (sun) with rituals of water. It is located 8 kilometers from the Main Square of the Cusco. For more detailed information on this site, visit our Tambomachay article. Located 5 km. To the east of the city of Cusco. It is known as a place of worship. Representations of felines, monkeys and snakes carved on rocks can be found. It is an interesting place, particularly for followers of occultism and spiritualism.